This year has been one of trying to get to a healthier me. It has not been easy. After my last baby I had a heck of a time losing weight. I spent many months being asked if I was pregnant again. How utterly embarrassing and damaging to a new mothers self esteem. Sure at baby number four I'm hardly considered a "new" mother, but rest assured that each pregnancy, each post pregnancy moment brings with it it's own challenges and everything before it seems the easiest thing ever done. Like the birthing experience, how easily we forget the challenges once they have passed. I went through a few tests and found that my only issue with my weight was me. So I dropped 30lbs. I was feeling good, but the one thing that never changed was what I can only describe as a heaviness in my abdomen. I've experienced this heaviness for the last 14 years. I first felt it when I lost most of my pregnancy weight with my eldest. However, the doctor I was seeing at the time felt it was nothing and let it go. It wasn't a constant ache and I'd just sleep with a pillow under my belly to ease the weighted feeling if I slept on my side. For the most part, working out helped ease any overt discomfort during the day. Eight years later I had my second son. Then two years after that my daughter. The weighted feeling only happened at night when I slept on my left side, I associated it with being overweight. I gained 30lbs and then the weight with pregnancy, even with weight loss, I was always a constant 30lbs overweight. Then two years ago I gave birth to baby L, all things changed, and that brings me to today. So I was doing well and lost 30lbs of pregnancy weight, and the pain in my abdomen became constant and unreal once I hit 178lbs. I would be at work and randomly double over in pain. Sleep became broken and the pillow under my stomach no longer eased anything. I went back to my new doctor. An internal ultrasound was done and that is when they found it. A dermoid cyst on my left ovary. Finally I know what the heck is going on. Now what does this mean? Are they willing to remove this, or do I have to go through more years of pain and discomfort? An MRI was scheduled two months later to determine the size. Then I was scheduled to see a surgeon at the Heartland Fertility & Gynocology Clinic where I got another internal ultrasound so he could check out the situation. The Dr. was amazing. I was also dealing with severe PMS after my last baby and he helped me with that as well. Showing me what was causing it and giving me a solution. After explaining the procedure, that they would take the cyst and most likely the tube as well, I was put on a waiting list. Most people would be furious with a 3-6 month wait after fourteen years of pain, but seeing as I had a half marathon coming up in three months, I was in no hurry for it to happen until after my race. Praise be to God! A week after my race I got a phone call from the clinic asking if I still wanted the surgery as they had a cancellation. My eyes lit up, of course I do. The next week I filled out forms and the date was set. November 29, 2012. That month was the longest month ever. The pain and flare ups were constant from Halloween night on and I had to stop losing weight and maintain a 182 - 185lbs weight to keep most of the pain away. Then, a week before the surgery I got sick. Praise be to God again! I was almost 100% better by the morning of the surgery. Thankful to all my friends and family for their prayers and well wishes for fast healing so I could get my surgery. 10:30am I walked into the Grace Hospital in pain with a weighted belly. At 8:30pm I hobbled out of the wheelchair into my father's car drowsy, in pain, but no more unbearable weight. I did ask for pictures. I figured I should get to keep some momento of the thing that I grew in me for 14 years that I finally got to birth. 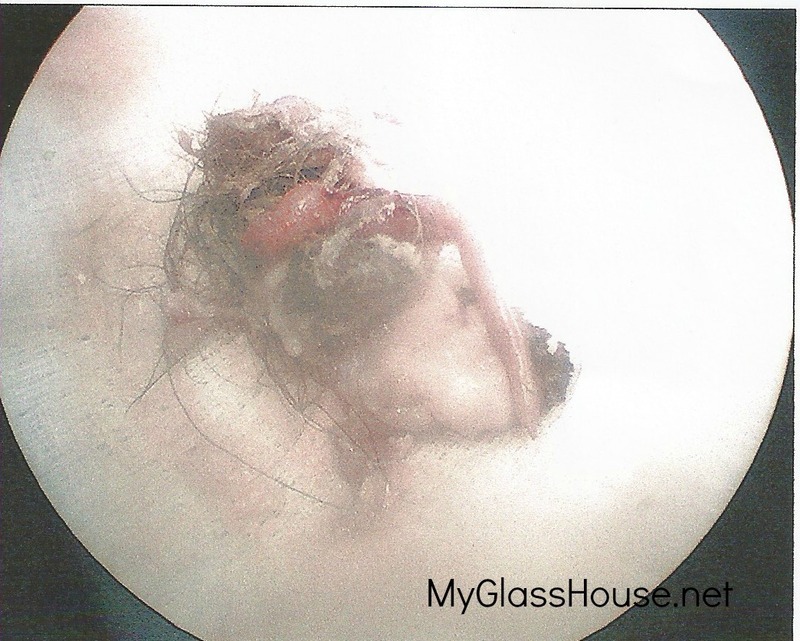 So here's the gross part of my post, the queasy best look away now. Look at this sucker! That is my ovary. The cyst is somewhere inside. Apparently I'm a clam growing my own personal pearl. Do you think they go through this much pain popping one of those precious suckers out? Look at the difference. That is what a 6cm cyst inside an ovary does. On the right is what a normal ovary should look like in form and size. On the left is my Pearl. Yes, as of right now, dermoid cyst is named Pearl. Alrighty all. Meet Pearl. My hairy, cartilage filled dermoid cyst. Absolutely creeptastic. Would have been cooler if maybe there was some teeth or an eye don't ya think? (They did take Pearl and my left fallopian tube). Four incisions later, I'm on some pretty decent pain killers and relaxing in bed. At least for now. I have four kids, we had a family function tonight and my hubby goes back to work on Monday. I think I need to find me a babysitter for the next week. Any takers? You can have a closer look at Pearl if you'd like.